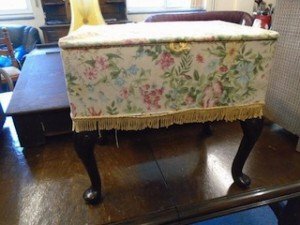 A vintage raised sewing box on mahogany legs, upholstered in floral patterned fabric with fringe edging. 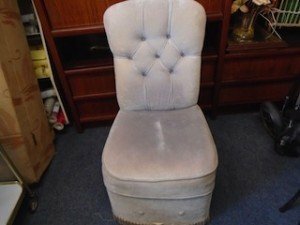 A vintage high back storage nursery chair, upholstered in grey velour with button back and fringe detailing. 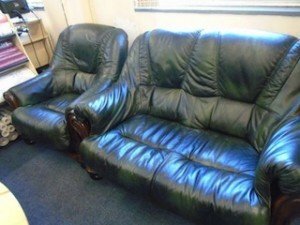 A vintage two seater high back sofa on a mahogany base, together with matching armchair, upholstered in deep green authentic leather. 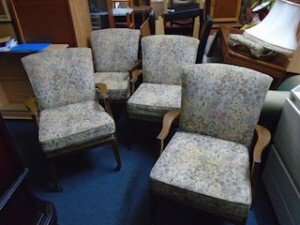 A set of four matching low back solid wood dining chairs on castors, upholstered in floral patterned fabric. 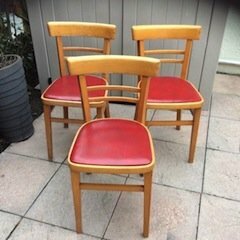 A set of three solid pine curved back dining chairs, upholstered to the seats in authentic red leather. 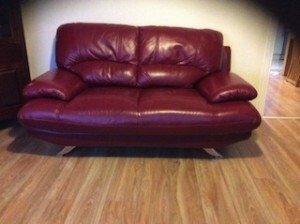 A two seater high back retro sofa on chrome feet, upholstered in cherry red authentic leather. 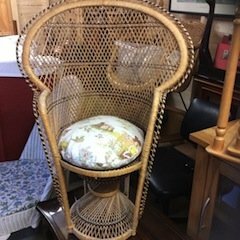 A tall standing curved back wicker armchair, having one removable round cushion upholstered in bambi patterned fabric. 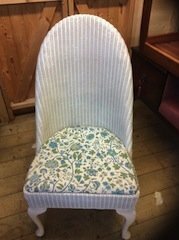 A hand painted white high back wicker armchair on wood legs, upholstered in green and blue floral patterned fabric. 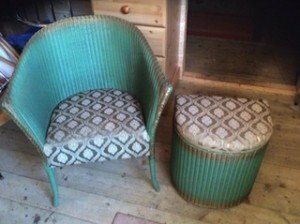 A vintage teal painted wicker tub chair and matching laundry basket, upholstered in silver and grey damask fabric. 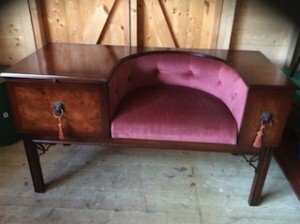 A vintage Burr walnut telephone table, having one drawer either side a salmon pink velour seat. 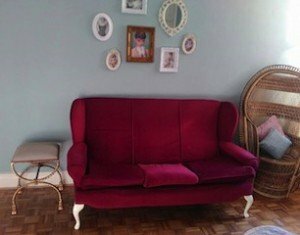 A retro high back three seater sofa on white wooden legs, upholstered in wine red velour. 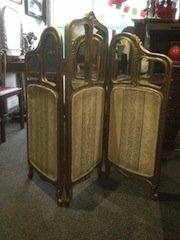 A tall standing heavily carved gold painted tri folding room divider, inlaid with patterned fabric and mirror panels. 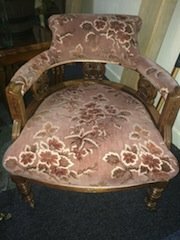 A vintage heavily carved solid oak curved back hall chair on castors, upholstered in floral patterned velour. 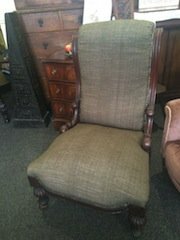 A heavily carved mahogany high back hall chair on brass castors, upholstered in army green canvas. 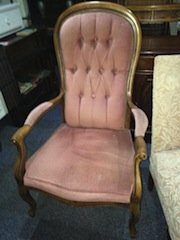 A Victorian style high back solid wood armchair, upholstered in pale pink velour with button back detailing. 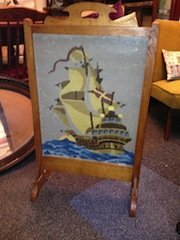 A solid pine tall standing fire guard, having and embroidered ship mural to the centre. 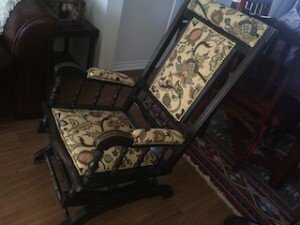 An antique Victorian dark mahogany rocking chair, upholstered to the seat, armrests, backrest and neck rest in floral embroidered fabric. 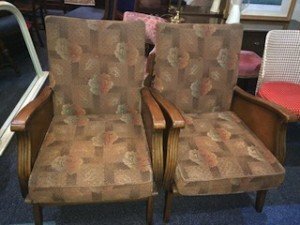 A pair of vintage solid oak high back armchairs, upholstered in floral patterned brown fabric. 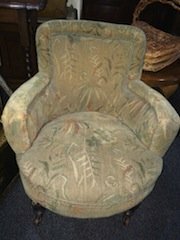 A vintage high back armchair on mahogany legs and castors, upholstered in floral and leaf patterned fabric. 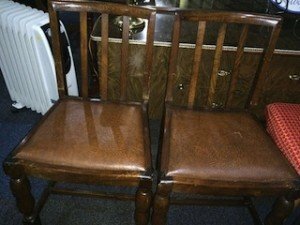 A pair of vintage art deco solid oak occasional dining chairs, upholstered to the seats in authentic leather.